One week a month, Watch This offers staff recommendations inspired by a new show coming out that week. This week: The return of Amazon’s Red Oaks has us thinking about TV’s other exclusive clubs. Snooty siblings Frasier and Niles Crane had probably been locked in competition since the latter’s birth. Even though Frasier had never dropped so much as a hint about his younger brother while in Boston—that’d be because the character was hastily created for Frasier—he’d had Niles in his shadow the whole time. Or at least, Niles would have been, had Frasier not moved out East to start his own private psychiatry practice. So it really brûléed his crème to then have Frasier not just horn in on his act, but become the more prominent Dr. Crane in the city. Of course, the opera-length gloves come off as soon as the brothers learn there’s only one spot available in the Empire Club, and the heaping praise quickly becomes scorn. 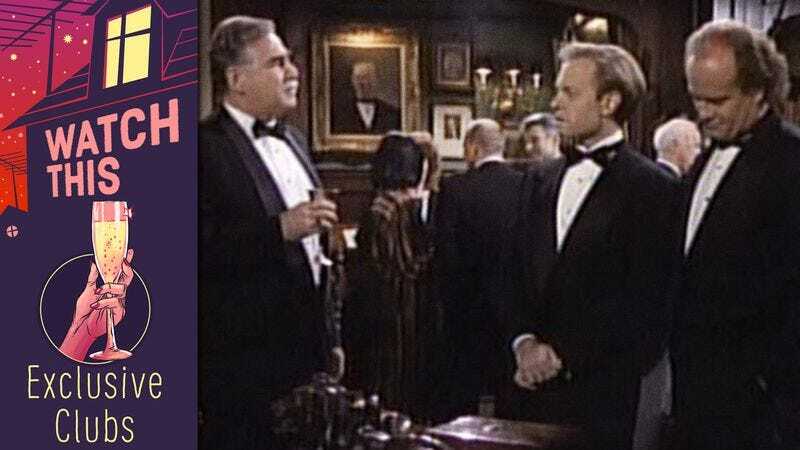 It’s almost impossible to imagine the series without all of the brotherly competition more than 20 years after it premiered, but “The Club” makes an especially good case for the addition of Niles. The character was inspired in part by David Hyde Pierce’s resemblance to a young Kelsey Grammer, and the notion of having two feuding fussbudgets quickly took hold. Availability: The complete series is available on Amazon Prime Video, Hulu, Vudu, and CBS All Access.